Together with a phone call from my Mom & Dad and a sweet e-mail from Emil, Dane and David made my birthday into a lovely day of indulgence, Néné style. It was a beautiful sunny day – don’t usually have many of those back in Denmark! 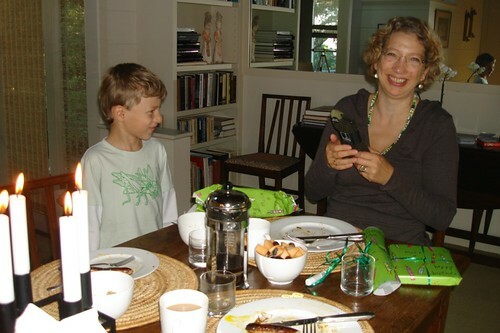 – and I had yummy brunch with cards and presents. From Dane the necklace he’d made out of beads we’d bought earlier in San Francisco and a pair of Merino wool extra warm and soft socks. They came in very handy when we went to Yosemite. More about that later. And from David a book that could change my life – or maybe at least make my blog posts more pleasurable to read: Read like a writer. Then we drove up to Sonoma County to try out some wine tasting. The previous afternoon, in the above-mentioned café, I’d talked to a young man who’d recommended a couple of smaller places for wine tasting and a restaurant. So we went along according to his instructions and found the Family Wineries where we tasted a variety of whites, reds and dessert wines. We found most of the wines a little bit “young” tasting, but loved a red dessert wine and bought a bottle for our Christmas dinner. It will go well with the Danish Christmas dessert with the French name: Ris (rice) a l’amande. Then we drove on and saw several other alluring places to taste wine, but even if we didn’t drink all the wine, we’d really had enough. Maybe not alcohol-wise, but certainly taste-wise. Then we went in search of the restaurant, which proved as easy to find as everything else the young man had directed us to. Thanks to this young man for his great advice! The restaurant was in a little quaint looking town called Graton. Underwood turned out to be one of the best restaurants we’ve been to on our trip. Only the restaurant in New Orleans equaled it. It was a nice and cosy place full of people. The service was excellent, the menu varied and the food lovely. A great finishing touch to my birthday. I wonder what they mean by that, “The Way Life Should Be”? Must be something with reddened leaves, fresh-cheeked youth, noisy snowmobiles and lobsters for dinner??? I’ve spent a good part of today in Freeport Community Library and it has been lovely. Outside it’s sunny but cool, and Dane and David are fishing. In here it’s quiet, comfy and… eh… bookish! Haven’t read a single page though, been busy on the computer. Freeport probably wouldn’t exist if it hadn’t been for the extraordinarily well run and well stocked out-door department store L.L. Bean. We spent the best part of yesterday in there and got some good autumnal clothing for the three of us. David is now a record-holder in the number of fleeces owned by one person (who’s not a mountaineer). It looks so nice you’d almost consider going in there to eat! And the whole town looks like that. Real neat, as the Americans put it. We think we’ve solved the Halloween problem I mentioned yesterday. We went for gas at a little gas station out in the woods. In there everybody were talking about baseball, baseball, baseball and then a little bit about Halloween. It turns out there are several public arrangements, so we’ll go for some of that and hope that the usual American friendliness will extend to our little Dane. Will tell you how it goes. And so, don’t you want to know if the Red Sox won the game last night? I bet you don’t give a toss. But they did. They wiped out the Colorado Rockies 13 – 1. We’re already readying ourselves for the next game tonight. Can they do it again? More commented pictures (not of baseball stars) here.